You may be surprised to find out that many health benefits of flaxseed oil are, in fact, weight loss benefits – that’s why you will want to include flax oil in your daily diet in a variety of ways. You’ll find a couple of tasty, super-quick flax seed recipes by the end of this article. Let’s start by taking a look at the many health benefits of flaxseed oil.Then, we’ll discuss why flaxseed oil capsules aren’t your best choice. You’ve probably already know about the powerful connection between omega 3s and weight loss. 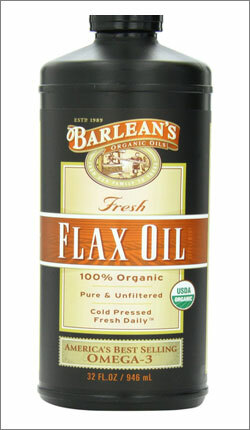 Well, before anything else, you should know that flaxseed oil is a rich source of omega 3. As a matter of fact, flax oil is 52% richer in omega 3 than fish oil, with more than three times more omega 3s than omega 6 fatty acids. In fact, this is one of the most important benefits of flax seed oil – given the great deficit of omega 3 compared with omega 6 fatty acids in the current Western diet, deficit causing a wide range of alarming essential fatty acid deficiency symptoms. The simple truth is that your energy resources are based on the metabolism of lipids, or fats. In other words, to function efficiently, your cells require true polyunsaturated, electron-rich lipids, which are present in abundance in raw flaxseed oil. You will never store the calories from flaxseed oil as body fat, which makes it perfect for any raw flax seed recipes in your weight loss diet. Did you know that one of the key elements in fat burning is the transfer of oxygen into the 75 trillion cells of your body across the cellular membranes? And, flaxseed oil maintains the integrity and good function of these membranes – hence your body’s oxygen transfer and fat burning are much more efficient. In fact, this is one of the most important health benefits of flaxseed oil, on which the famous Budwig Diet is based. Well, it means that – besides burning more body fat – you experience this increased oxygen consumption at the cellular level as greatly increased physical and mental energy, vigor and an overall feeling of well-being. Since one of the most important health benefits of flaxseed oil is the optimization of all metabolic and physiologic processes in your body, using flax oil on a regular basis helps you lose weight naturally. 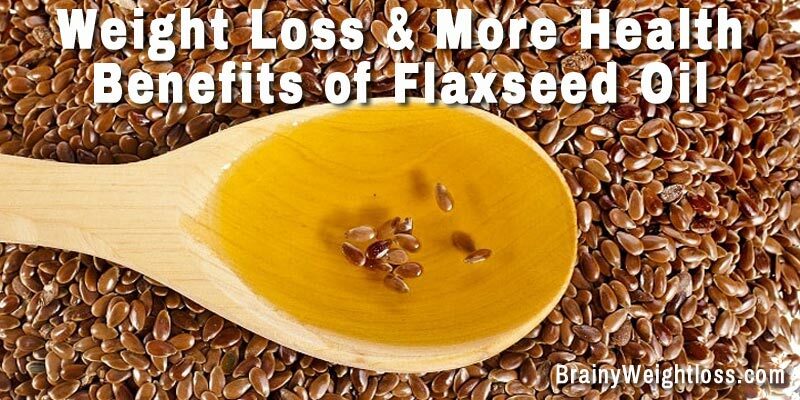 Talking about the health benefits of flaxseed oil in relation to weight loss, you must remember this. You can reduce your appetite and extend the feeling of fullness and satisfaction after a meal just by adding flaxseed oil to your foods. Because the omega 3 fatty acids in flaxseed oil cause your stomach to retain food longer compared to low-fat foods. Due to the sustained increase, prolonged plateau, and gradual drop in your blood sugar, you experience a corresponding prolonged feeling of satiety and increased energy. Bottom line? You’ll actually eat fewer calories in the long run. Try it. You will see remarkable results sooner than you think! Aside from the health benefits of flaxseed oil discussed above, its increased popularity is due to the growing mercury and dioxin contamination of fish. Salmon, tuna, mackerel and halibut used to be recommended as healthy omega 3 sources in the past, but not anymore. True, unlike fish oil, flaxseed oil actually contains the fatty acid ALA (alpha-linolenic acid), the precursor of the essential omega 3 fatty acids EPA and DHA that your body can’t live without, but to a great extent, your body is able to convert ALA to EPA & DHA. You should know that flaxseed oil comes in two forms: bottled oil or capsules – you can find them both at any health food store. 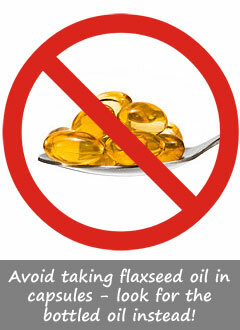 Forget about the flaxseed oil capsules – the oil content is much more processed, plus they are more expensive as well. Flaxseed oil capsules are not practical either: you’d have to swallow about 12 large capsules to equal just one tablespoon of oil. It’s totally insane, I know. Instead, look for bottled, organic flaxseed oil that was cold-pressed to minimize the damaging effects of light, oxygen and heat – the label will say. This oil becomes rancid very easily, so only buy oil that comes in an opaque bottle, has a pressing date less than 4 months old and is kept in the refrigerated section of the store. It might be a bit more expensive, but it’s well-worth every single penny. Put it in the refrigerator as soon as you get home or, if you don’t plan to use it right away, keep it in the freezer. Don’t even think to use it for frying or sautéing, because it degrades quickly when exposed to heat or light. A normal daily serving of flaxseed oil is about 2 full tablespoons (15 grams or 135 calories) of flaxseed oil per 100 pounds of body weight. Make sure you don’t take more than that to avoid any flaxseed oil side effects. You’ll be pleasantly surprised to see that the oil has a mild nutty taste that enriches all flax seed recipes… Mix it in your cereal, fruit smoothies, salads, stews and soups. IMPORTANT: add flaxseed oil to hot dishes only just before serving, AFTER they have cooled down, as flax oil gets destroyed at temperatures higher than 108° F or 42° C.
To fully experience the weight loss and other health benefits of flaxseed oil, add it to your yogurt, use it in salad dressings mixed with (or even instead of) extra virgin, cold-pressed olive oil and in various weight loss shakes recipes. This is one of the simplest flax seed recipes… You’ll absolutely love this fat-burning, flavorful and nutritious balsamic vinaigrette – in fact, you may never try another salad dressing! 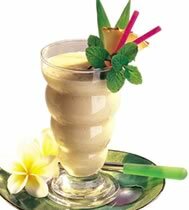 Blend all ingredients in a small blender and pour in a glass bottle or jar. Shake well before tossing it in your favorite green salad. 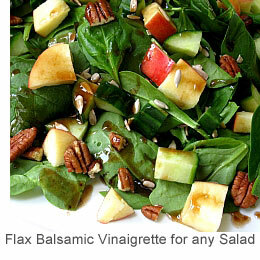 Because flaxseed oil is sensitive to light and temperature, be sure to refrigerate this vinaigrette between uses. How would you like to enjoy instant energy and the full benefits of flax seed oil with a fat-burning smoothie done in less than 5 minutes? Throw everything in a blender, mix 1 minute and sweeten with Stevia to taste if you need to. From all flax seed recipes, this smoothie is my favorite… It’s great for a quick power-breakfast or lunch allowing you to experience a satisfying fullness and an increased metabolism along with the other health benefits of flaxseed oil and of powdered, ground flaxseed. Would you like more delicious flaxseed oil recipes – including incredibly tasty dressings? No spam. Your email is safe with me. You can unsubscribe at any time.